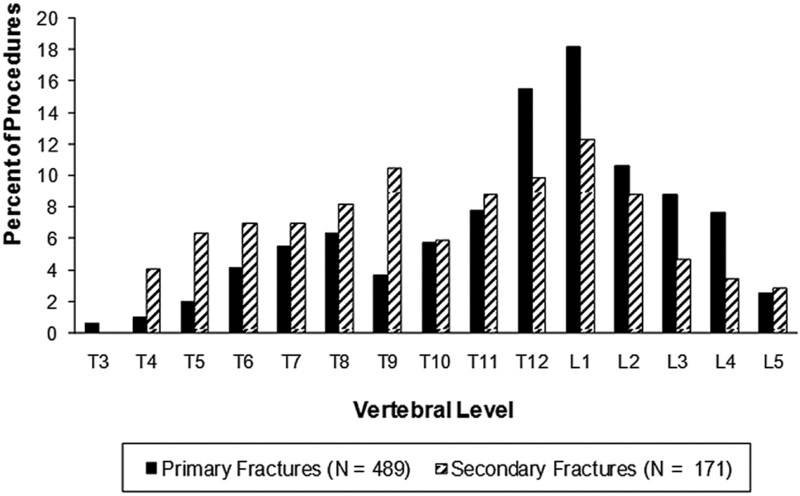 Distribution of primary and secondary vertebral compression fractures in patients with osteoporotic vertebral compression fractures. Note: Primary fractures are first-time fractures for which vertebroplasty was performed. Secondary fractures are subsequent new fractures that are adjacent or nonadjacent to the primary fractures. Note:—VAS indicates visual analog scale. * Primary vertebral compression fractures (VCFs) are first-time fractures for which vertebroplasty was performed. † Secondary VCFs are subsequent new fractures that are adjacent or nonadjacent to the primary fractures.